The most recent escapade of People for the Ethical Treatment of Animals has been roundly excoriated right across the political spectrum. An opportunistic and grossly insensitive ad scheme to push an unconnected agenda? Or a timely observation made while our minds still carry the horrific images of the recent Greyhound bus slaying? Taking my courage in my hands, I'd like to attempt a weak defence of PETA. Weak, because the tactical sense of these folks is so minuscule that sometimes I could almost bring myself to believe, to paraphrase Deb Gyapong, that they're doing psy-ops for some militant eat-'em-raw carnivore outfit. Anyone who has ever dealt in tactics and strategy--as I have done, back in the day--usually asks basic questions about new moves: Who is the audience? Will our message resonate with the audience? Will it cause members of the audience to act? How does the action being proposed fit into our over-all strategy? What objective do we wish to achieve in order to move further towards our goal? Clearly the PETA folks doesn't ask themselves such questions, or, if they do, they don't listen very hard to the answers. The result? Nearly everyone thinks they're cultish whackos. Maybe they are. No one comes on board with these tactics. Indeed, are "tactics" even at issue here? Or merely a kind of nonstrategic personal therapy, a massaging of self-righteousness? But put yourself, just for a moment, in their place. 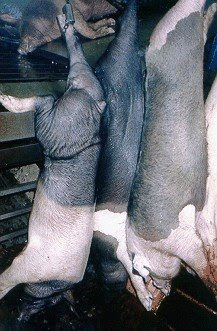 For years, PETA has documented untold instances of regular, routine, depraved cruelty to animals. There are other instances that perhaps should have invited their attention as well. We accept that cruelty, or we do nothing about it, or we rationalize it, or we put it out of our minds. Now, imagine yourself holding the belief that deliberately causing suffering to animals is an unspeakable evil. That it is morally equivalent to doing the same to human beings because animals too can feel pain and fear. That "higher" animals, at least, are conscious beings, persons with rights. Those of you with dogs or cats: the next time you look into your pet's eyes, just try to deny it. But no matter what you say, you can't get your message across. Most people nod and plod past you, sleepwalking as the horrors continue, taking no action. Animals, living and dying in agony. Yup, a pity. Once in a while we come almost to full wakefulness--when, for example, a bunch of demented children microwave a cat for the pleasure of hearing it scream. But the lives of countless animals in factory farms are of no account. The torture of bears in India causes us maybe a little unease, but doesn't rouse us to act. Ditto the living hell that is a roadside zoo. Ditto the miserable lives of circus animals. It just goes on and on. We are desensitized for a whole lot of reasons. But desensitized we are. And the handful of people moved by empathy to act, to stop the routine of animal torture, just can't seem to rouse us. They get desperate. They try to shake us awake. They hold up mirrors; they make what we think of as offensive false parallels. For them, of course, there is no question of parallels or equivalence: it's all the deliberate infliction of cruelty on others. It's not denigrating the tragedy of the Holocaust to refer to the mass suffering and destruction we cause to fellow-beings who feel fear and pain just as the victims of the Holocaust did. And it's not belittling the horror of the McLean killing to point out that similar things are done every day to those fellow-beings. The outrage that most people express when PETA tries to make its point with in-your-face ad campaigns is entirely understandable--but that outrage is at least partly predicated upon the belief that animals are a lower form of life with few or no rights: and that we, to use the invidious Judaeo-Christian formulation, were given "dominion" over them by our mutual Creator. Again, put yourself in a PETA activist's shoes. What would you do in his or her place to help end a monstrous, continuing evil that no one else seems to think is evil at all? What tactics and strategy would you use? If all else fails, wouldn't you, too, be reduced to screaming at the uncaring masses who go about their lives unconcerned about the hideous cruelty on a simply colossal scale that is going on all around them every day--and in which they even have a stake? I am not a PETA member. I think PETA ought to be searching for tactics that actually win allies, rather than effectively giving up on us. But I genuinely do feel their pain. This page contains a single entry by Dr. Dawg published on August 7, 2008 2:03 PM. More Harper hypocrisy was the previous entry in this blog. Toronto's war on the poor is the next entry in this blog.